I officially adopted Buster a couple of weeks ago. He’d been with us since the end of November, and we seem to know each other pretty well. The adjustment period for a new animal is around two months, give or take a week. Buster’s adjustment period was short. Within five minutes of his arrival, he and Luna were racing around the yard together, chewing on each others’ necks, all that fun dog stuff. Buster fit so easily into the household, it was almost as if he’d always been here. Except for some inappropriate chewing episodes (the woodwork ledge by the patio door, the ballpoint pen enthusiastically destroyed on my bed) and a persistent interest in stealing cat food from the kitchen counter, he’s really been no trouble at all. I’ve had two or more dogs for a long time. Never have two of them been great friends like this. Luna’s the more dominant dog, but only slightly. Theirs seems to be an equal partnership. Once I signed the adoption contract and wrote my check to Carver-Scott Humane Society, something changed. I think the animals know once you have committed to them forever and ever. Take my cat Cricket, for example. I fostered her for months after she came to me with her brother and sisters as a family of four-week-old orphans. I regularly trimmed the kittens’ nails, because it’s good to offer for adoption a kitten who already knows how to get a pedicure. It makes it less likely that the adopter will want to declaw the cat, and its just a good idea to start the young ones off with good habits. So Cricket got her nails done, surprisingly with a minimum of struggle or strife because I am not the most coordinated lady on earth. Shortly after I signed the adoption papers and paid the fee, I got my clippers out, happily thinking it was good that at least one of my cats had proper nail training. Our life together would be a snap. How wrong I was! Miss Cricket writhed and flipped and in general let me know that she was not interested in a pedicure, that day or ever. How did she know that she was here for good, whether she had neatly trimmed nails or not? 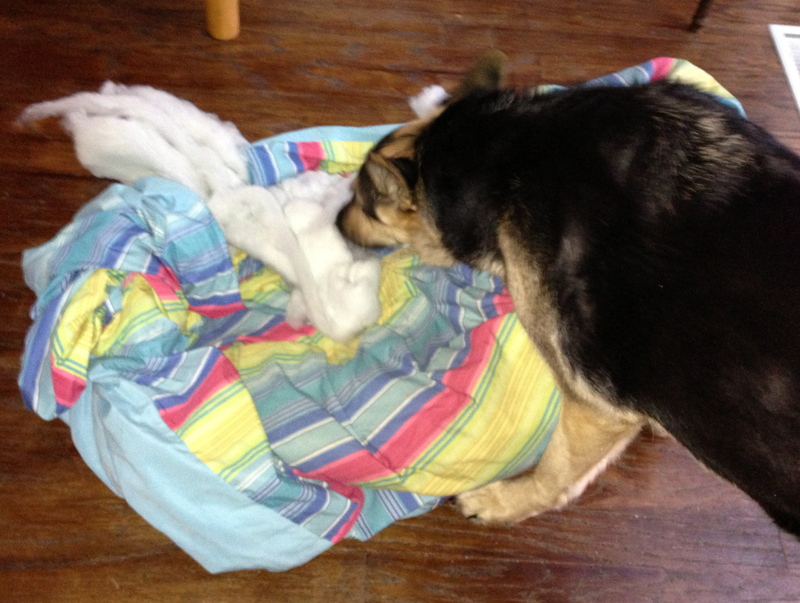 Buster has shown his appreciation for my lifetime commitment to him by ripping the stuffing out of not one, but two, comforters. I was secretly hoping something would happen to one of them, because it had a nice Rorschach ink blot right in the middle of it (see paragraph one, above, about Buster’s chewing adventures). The other one had been with me since before the Flood and I was used to seeing it folded neatly at the end of the bed, ready to warm me on those ‘two quilt’ winter nights. So sad to see an old friend go. Special Investigator Luna gives the ruined comforter a final check before it goes to Quilt Heaven. But, life goes on. The new extremely inexpensive one I bought yesterday at Target is still intact and -bonus – it brightens the room up. If he can just keep his mouth off it for another couple of months, I’ll be happy. 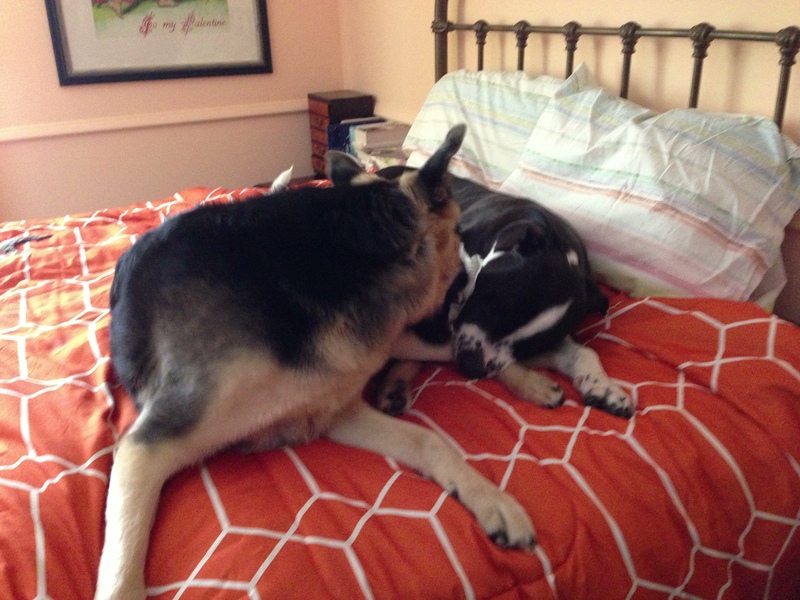 Double Agent Luna lends an ear to Buster’s secret plot to damage the new bedcover. Will she come to the authorities before it’s too late?